This past weekend I spent Sunday night at the University of Arizona‘s Kuiper 1.54-m (61″) telescope where the 1.54-m (61″) is the diameter of the primary mirror. This telescope is located in the Catalina Mountains north of Tucson, Arizona. The goal of the night was to learn more about a Near-Earth asteroid that could be a good target for a future spacecraft mission. During the course of the night, I was able to observe a few interesting comets. All images were taken with a R-band filter with North to the top and East to the left. 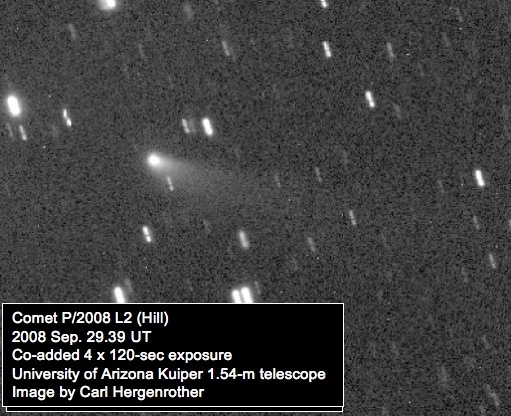 This comet was lost for 111 years before being re-discovered last month. Two small pieces of the comet have also been observed and this may mean the comet is brighter than it usually gets. 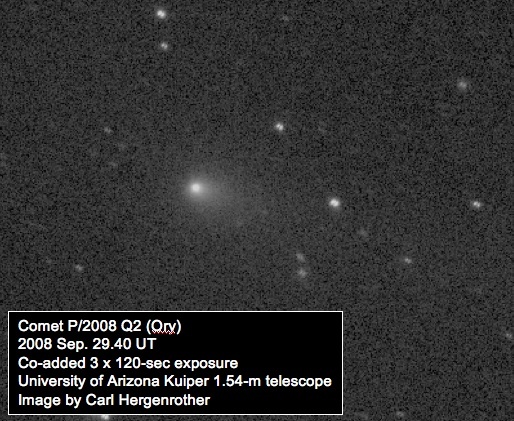 Two older posts go into more detail on the discovery and splitting of this comet. The images from Sunday evening show the main comet (component A) shining at R magnitude 12.6. At this brightness, only the most advanced amateurs with very large backyard telescopes can see this comet without a digital camera (CCD). The small comet in front (to the right in the image below) is component B. At R magnitude 18.6, it is 250 times fainter than the main comet. A third component was discovered a few weeks ago (component C) but I was unable to see it, though I’ll have to admit that I didn’t try very hard to find it. 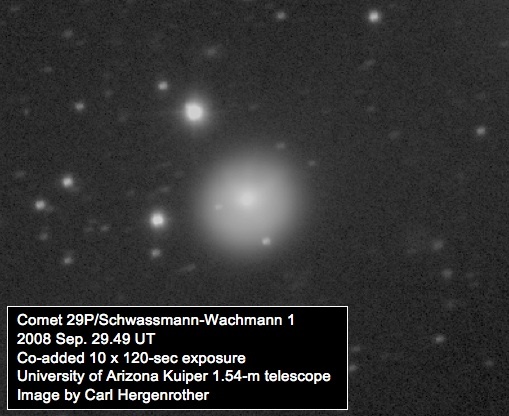 Schwassmann-Wachmann 1 (SW1) is one of the most interesting comets out there. Most comets are on long elliptical orbits around the Sun that take them close to the Sun and then very far from the Sun. Usually comets are brightest and most active when they are closest to the Sun. SW1, on the other hand, is on a near-circular orbit that only varies from 5.7 to 6.3 AU from the Sun. More importantly, its orbit always keeps it further from the Sun than Jupiter. Most short-period comets with periods less than ~10 years only get out as far as Jupiter and are barely active at that distance. The fact that SW1 is always active at these distances is rather amazing. 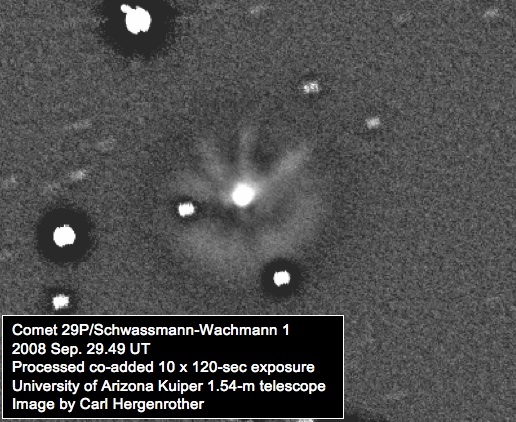 The comet was discovered in 1927 by the same German team that found Comet Schwassmann-Wachmann 3 which was observed in 1000s of pieces back in 2005. Most of the time, SW1 is rather faint at ~18th magnitude. Every few months, the comet experiences a sharp increase in activity (we call this an outburst) and rapidly increases in brightness. It currently is experiencing one of its biggest outbursts and shines with a R magnitude of 10.9, bright enough for advanced observers with large backyard telescopes. The image below is a straight forward with no image processing other than the usual techniques to fix up problems inherent to the camera and telescope (bias subtraction and flat fielding). The next image was processed to bring out more detail in the coma of SW1. A technique akin to an unsharp mask was used. A number of possible jets (the straight lines radiating from the center, or nucleus, of the comet) are seen. A shell of material is also visible to the south of the nucleus. The material will slowly expand with time and the comet will dim until the next outburst. This comet was a nice binocular comet this past summer when it passed within 0.85 AU of the Sun and 0.21 AU of the Earth. It is now outbound and rapidly fading. 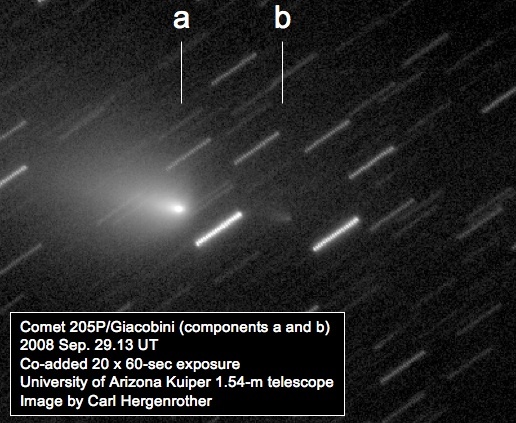 The comet was discovered by Andrea Boattini of the Tucson-based Mount Lemmon Survey on 2007 November 20. The Mount Lemmon Survey observes with a telescope just up the road from the one I used to take these images. 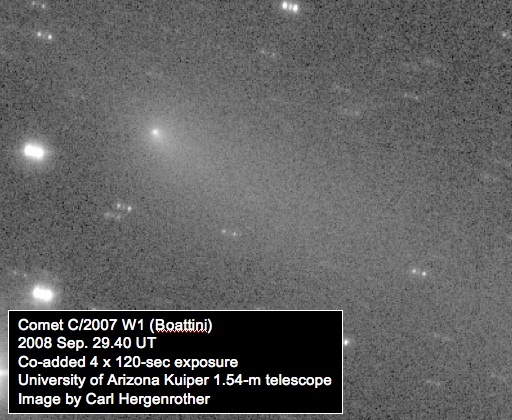 Comet Boattini is a long-period comet and will not return for many tens of thousands of years. Rik Hill found this back on June 12 of this year. The comet is on a 14.7 year orbit which brings it within 2.3 AU of the Sun and out as far as 9.7 AU. That’s almost as far as the orbit of Saturn. Rik works for the Catalina Sky Survey (same group but different telescope as the Mount Lemmon Survey) and used the Catalina schmidt telescope which is located across the parking lot from the scope I used. It’s measured R-band magnitude was 15.4. Comet Ory is also a short-period comet with a 5.8 year period and an orbit that takes it between 1.4 and 5.1AU. Michel Ory, an amateur astronomer from Delemont, Switzerland, found this comet on August 27. This is Michel’s 1st comet though he has 2 supernovae to this credit. The comet’s brightness was measured at R magnitude 14.9. Lucky you to get time on such big scopes. Great information and images. Thanks for sharing them!